One of Shakespeare 's earliest and most popular plays, The Taming of the Shrew was first produced in 1593-94, though may have been written much earlier. The primary source is unknown, but Shakespeare based the play partly on George Gascoigne's comedy Supposes (1566), which was based in turn on Ludovico Ariosto's I suppositi (1509). Though its central theme of a man "taming" his independent-minded wife initially appears outrageously sexist, especially in a post-feminist context, the play itself is rather more complex that that would suggest, and it's by no means clear whether Petruchio is really the one who ends up victorious. Unsurprisingly, the play has had a great many film and TV adaptations, both direct and indirect. The first British production was made in 1911 by the Co-operative Film Company and adapted from F.R.Benson 's Stratford production. 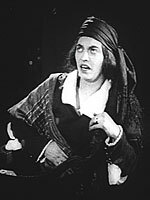 It no longer survives, but trade paper Bioscope praised "its fine acting and vigour throughout the well-staged scenes" and confirmed that it was part of the same series that also included Richard III . On the evidence of the surviving copy of the latter, this suggests that it was another truncated pantomime version of the play, with snippets of Shakespeare's original text featured in scene-setting intertitles. The second production, made for the British and Colonial Kinematograph Company in 1915, is similarly lost, but is of historical interest for its use of a primitive sound process called Voxograph, which involved offstage actors dubbing the voices at the same time that the performers were filmed, a technique later adopted by Alfred Hitchcock for his first sound film Blackmail (1929) when his lead actress' strong accent proved inappropriate for the role. British and Colonial were also responsible for the earliest surviving British film, a 1923 adaptation that reduced the play to about about 22 minutes but which was otherwise an intelligent attempt at visualising it, retaining many of Shakespeare's best lines as intertitles. The first television version was made by Dallas Bower and broadcast by the BBC in 1939, starring Margaretta Scott (Katherine) and Austin Trevor (Petruchio), followed 13 years later by a second version, directed by Desmond Davis and starring Stanley Baker (Petruchio), Ernest Jay (Baptista) and Margaret Johnston (Katherina). As so often with television productions of this era, these were both live broadcasts and no copies appear to survive - though a telerecording exists of The Tamer Tamed , a 47-minute one-act comedy by Elaine Morgan which the BBC screened on 7 February 1956. Written in cod-Shakespearean blank verse, it imagined how the two central couples were coping after a year of marriage. 1967 saw the most expensive and high-profile screen adaptation to date, directed by Franco Zeffirelli . While technically an American-Italian co-production it had an almost entirely British cast led by Richard Burton and Elizabeth Taylor and a strong British presence behind the camera. Exuberant and raucous, it presented a thoroughly traditional view of the play, exacerbated by the fact that the vastly more experienced Burton seemed far more at ease with Shakespeare's text. 23 October 1980 saw the broadcast of the BBC Television Shakespeare version, directed by Jonathan Miller and starring Sarah Badel (Katherine), John Cleese (Petruchio), Susan Penhaligon (Bianca) and Frank Thornton (Gremio). It was one of the most memorable entries in the series, thanks largely to the adventurous casting of Shakespeare neophyte John Cleese in the wake of his success with Fawlty Towers (BBC, 1975, 79), though this belied Miller's unusually cerebral approach to the play, which presented the Petruchio-Katherine relationship not in terms of a straightforward battle of the sexes but as a psychological enquiry. The accompanying 25-minute Shakespeare in Perspective documentary was presented by the novelist Penelope Mortimer and broadcast two days earlier. Just over two years later, the play inaugurated the Channel 4 series Shakespeare Lives (tx. 5 & 12/1/1983, where it formed the basis of a two-part, hour-long National Theatre workshop in which director Michael Bogdanov and a small group of actors (Clive Arrindell, Joss Buckley, John Darrell, John Labanowski and Bill Wallis, with Suzanne Bertish and Daniel Massey as Katherine and Petruchio) performed and analysed individual scenes for the benefit of a live audience, whose contributions were also encouraged. The main theme under discussion was whether the play debases women, or simply depicts how they are debased. Although the animator Anson Dyer planned an adaptation of the play in 1920, it is not clear whether it was ever made - it certainly never seems to have been released, and no copies survive. Nearly 75 years later, a 26-minute version was produced for the second series of Shakespeare: The Animated Tales (BBC, tx. 9/11/1994). Directed by Aida Ziablikova from a script by the novelist Leon Garfield , it was performed by stop-motion animated puppets, voiced by Amanda Root (Kate), Nigel Le Vaillant (Petruchio) and Malcolm Storry (Christopher Sly). Witty touches include Katherine's flame-red ringlets writhing Medusa-like as she rants and rages, her first encounter with Petruchio staged as a Spanish dance with castanet accompaniment, a tubby little narrator appearing to fill in narrative gaps (the Lucentio-Bianca scenes in particular are barely mentioned), and some imaginative scene transitions that emphasise that the story was originally conceived by Shakespeare as a play within a play. To this end, this version not only retains the opening scene with the drunkard Christopher Sly (omitted from both the Zeffirelli and Miller productions) but also gives him a coda in which he tries Petruchio's shrew-taming skills on a barmaid. Inevitably, he fails. Possibly thanks to the success of the 1929 Hollywood version (immortal for its credit "By William Shakespeare, with additional dialogue by Sam Taylor"), the play inspired a number of 1930s British films. The portmanteau film Elstree Calling (1930) climaxes with a slapstick version starring Donald Calthrop , Anna May Wong and lot of custard pies, one of which hits Shakespeare ( Gordon Begg ). Although not directly adapted from the play, the 1930s comedies You Made Me Love You (d. Monty Banks, 1933) and Second Best Bed (d. Tom Walls, 1938) were clearly inspired by it, with the latter taking its title from a notorious provision in Shakespeare's will.